Advances are made daily in safety research. To be able to conduct evaluations in the most appropriate way, it is essential to acquire the most-up-to-date technologies and information and to share Shiseido's technologies with experts. That is, researchers in safety assurance at Shiseido have been working with outside experts in a wide range of activities. Some of those activities are described below. Shiseido regularly undertakes consultations on safety with Japanese and foreign experts who are active in safety assurance. Moreover, as a cosmetic company, Shiseido takes the opinions of dermatologists seriously. We actively participate in safety-related activities held by academic societies. Shiseido takes part in events held by cosmetic industry associations around the world (e.g., Japan Cosmetic Industry Association, Cosmetics Europe (CE) , Personal Care Products Council (PCPC) , ASEAN Cosmetic Association) , and actively exchanges information related to safety. 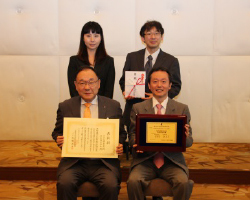 Shiseido also actively contributes to safety-related activities organized by relevant industry associations (e.g., Japan Chemical Industry Association, Japan Soap and Detergent Association, Japan Hair Color Industry Association). Researchers working in safety assurance regularly receive training at universities and public research institutions and take part in symposiums and education seminars held outside of the company to improve their levels of professional expertise and expert knowledge. Shiseido has also been collaborating with outside organizations on research topics that are the foundations of safety, such as sensory irritation, sensitive skin, and the development of hypo-irritant compounds, and the results have been useful in our efforts to develop safe, secure and reliable products. Efforts to find alternative methods are ongoing at Shiseido with the aim of further improving precision and expanding the domain of applicability. Shiseido has also taken on the challenge in developing alternative in vitro methods for evaluating long-term systemic toxicity. Shiseido has been pushing for the establishment of officially acceptable alternative methods for eye irritation and skin sensitization testing. Specifically, Shiseido has been taking part in the validation activities of the Japanese Center for the Validation of Alternative Methods (JaCVAM) and the European Union Reference Laboratory for Alternatives to Animal Testing (EURL ECVAM) and working as a member of the OECD’s expert team to draw up guidance proposals. The h-CLAT was listed on Economic Co-operation and Development (OECD) test guideline in July 2016. In addition, Shiseido has also been actively participating in the industry’s efforts to standardize alternative methods and to increase public awareness.